Save time and build your authority with consistent trustworthy health content! Let me do the research and writing for you so you can spend your time working with your clients. I'm Leesa Klich, MSc., R.H.N. Health writer – Blogging expert – Research nerd. This week, I’m welcoming a guest for you. I’m all about health research, credible blogging, and content strategy. But let’s be honest – social media is one of the keys to success for your blog and content marketing. 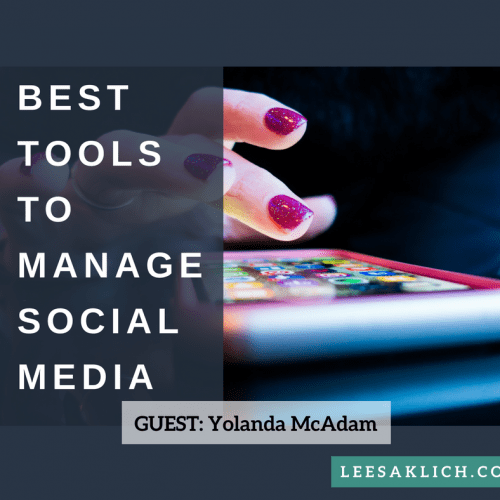 I’ll always admit where I’m not an expert, and that’s why I invited Yolanda McAdam, the Social media and marketing strategist from Suite 532, to share some of her expertise. In this post, she reviews the pros and cons of three different social media scheduling tools. If you’re manually posting to social media, these tools can really help you to save time. Especially because sharing (promoting) your blog posts over and over is necessary to get your hard work and valuable content in front of your ideal clients on a regular basis. In this post, I recommend the 3 best tools for time-crunched business owners like yourself to manage their social media accounts, but I’m going to start by talking a little about blogging and social media. A website establishes your credibility because it shows that you are one step ahead of other health professionals who live on rented space like Facebook. Furthermore, a blog helps you personalize your brand. It’s the place where you shine because it’s where you get to share a bit of your personality and a lot of your knowledge and experience. So relationship building starts in fact with your blog and not with social media. Now let’s dive in and take a look at the content you create. The best type of content is content that will continue to be relevant long after you’ve published it. This type of content is known as evergreen content because it will keep attracting readers. These special resources are in-depth examinations of a problem, solution, trend, or topic. They can help your audience find tons of information on a subject that interests them, which adds value to your blog. Of course in some industries, like health and wellness, scientific findings may impact your evergreen content from time to time. So remember to update your posts accordingly. Once you start blogging you need to make it easy for your readers to share your content. Do this by adding a social sharing plugin to your blog like Sumo (Free) or Social Warfare ($29. p/year). So you can bet your clients are on social media. The question now becomes not why aren’t you using social media for your business but how does social media help grow your business? Search engines look for relevancy and authority cues by tracking social media engagements, like when someone shares content from your site on Twitter for example. So the more people share your content via social media the better your ranking and visibility. Not only do your clients expect to see you on social media but so do your peers, journalists, PR professionals and potential collaborators. Social media helps extend your overall reach. Reach is the concept that all your fans and followers have their own fans and followers. So when someone who for example has 500 Twitter followers tweets your latest blog post, the reach of your blog post has expanded by 500 people. Now that you know you have to be active on social media it’s important that you choose the right social platforms because you want to be hanging out with your ideal audience. If you know who your competitors are (and you should), head on over to Buzzsumo and type in a competitor’s domain (you can also type in a keyword phrase like “wellness coaches”). Buzzsumo will then show you your competitor’s most shared content. If your competitors’ content is shared mostly via Facebook then you will want to be on Facebook. If you already have clients you can ask them where they prefer to hang out. Do this either face-to-face or on a call. If you’re just starting out and have no clients consider interviewing 3-5 people you regard as ideal clients. Chances are you are already on at least one social media platform following peers and industry leaders so you are a follower among followers. See what I’m saying, here? Always take into account your personal preferences because if you decide to do your own social media marketing it is vital that you enjoy being active on your selected platform or platforms. But know this: social media done right is time-consuming and takes a ton of work which is why you have to select a social media management tool to help increase your visibility and build a consistent online presence. There are many social media management tools to choose from which is why I am only sharing the three I use to schedule social media posts and content for my clients. What makes these three tools awesome though, is that there is something here for everyone. You can do a lot with Hootsuite‘s free plan however it can be confusing to use and there are many drawbacks (as you will see). This one is my personal favourite for all the following reasons and more. We’ll be checking each tweet before it is published, to find out whether it’s been sent on any of your Twitter profiles already (profiles connected within your SmarterQueue account). If it is a duplicate, we will retweet the original post instead of sending a new tweet. Here’s an example of super useful insights into Top Mentions for Retweets. Post Planner promises to skyrocket your social media engagement and boy does it deliver! This is the scheduling platform I recommend the most to solopreneurs who want to do their own social media management. Automation will give you more control over your accounts, help grow your audience and save you tons of time but in the end, social media is about building relationships. To be truly effective you need to be part of the conversation so don’t automate everything. Post your thoughts on trending topics, share tips and show up daily to engage with your audience. What social media management tool do you use? What are the pros and cons of your tool of choice? Yolanda McAdam, Social media and marketing strategist. Yolanda works with passionate solopreneurs and business owners who are aching to find and connect with the people who need their services and products. She is a social media and marketing strategist who helps small business owners attract quality clients and increase sales with BS-FREE strategies, tools and processes that work. You can learn more about her at Suite 532 and check out our #sociallyawesome interview here. 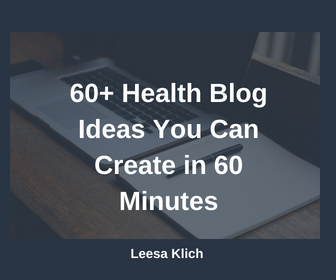 Use your health blog to grow your audience, subscribers, and sales. To see these and all the done-for-you articles for sale, click here. These articles are trust-building because they're expertly researched (I read the studies! ), written and edited. Just download, customize, and publish as your own. NOTE: I cap the sale of each one to a maximum of 73, so every single practitioner with a blog will NOT have these articles! Click here to see all of the "done for you" health articles you can choose from. I help health and wellness professionals build their authority with scientific health content. They want to stand out in the crowded, often unqualified, market of entrepreneurs. I help them establish trust with their audiences, add credibility to their services, and save them a ton of time so they don’t have to do the research or writing themselves. To work with me, click here.